Our last island day was in St. Thomas and we had an excursion planned through the ship. We arrived in St. Thomas super early and ate breakfast at the buffet before we went to meet up with our group to head to Coral World. 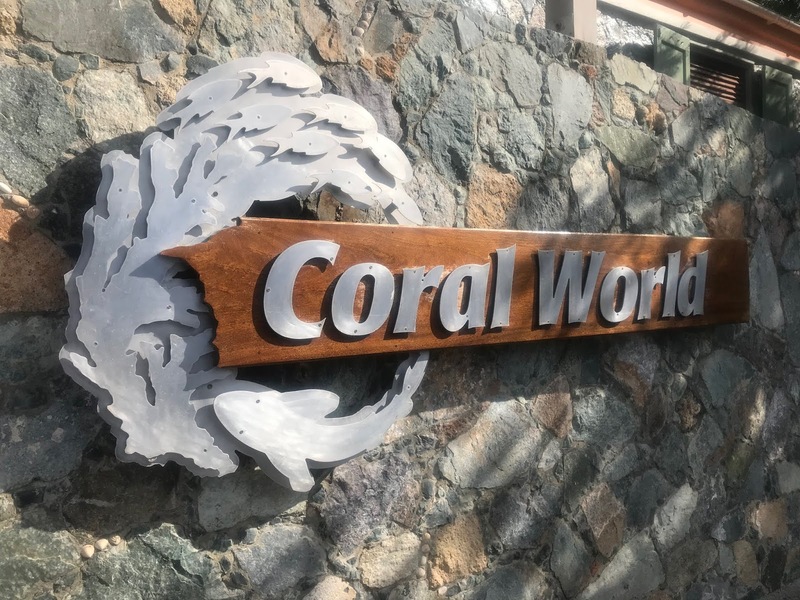 We booked the SNUBA excursion at Coral World which is in between scuba diving and snorkeling. We were each breathing through our mouths to an oxygen tank which was up on a raft above us. I have to say that is was very hard to learn to breathe in and out through your mouth. Both of us struggled a little bit with it but once we did get a hang of it we enjoyed exploring up to 20 feet below the surface! If you want to see more of our SNUBA adventure along with underwater video (and video of our entire cruise you can view my Youtube Travel Vlog. After our SNUBA excursion we had some time left before our ride headed back to the boat so we walked around Coral World which to be honest was kind of lame. We thought it would be more of an aquarium but honestly the exhibits were kind of lame. 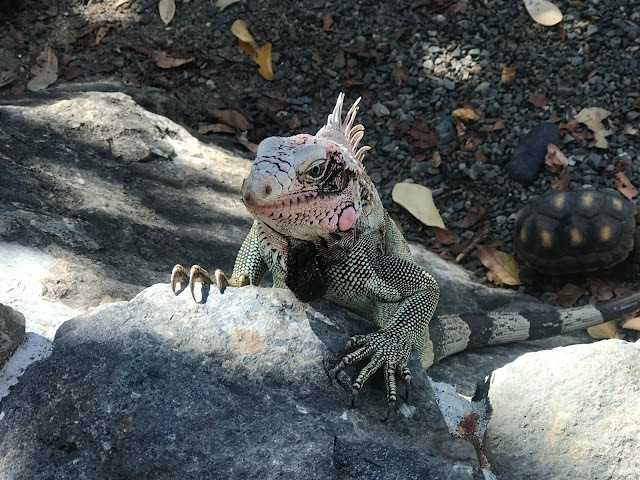 The best part was the baby turtles and the iguanas that seemed to be everywhere. We walked over to Coki Point Beach to swim a little bit in the crystal clear water. St. Thomas definitely has the clearest water of all the islands we experienced. I would definitely want to go back in the future. I loved trying out my new waterproof case from Amazon. It worked great! I wasn't great at aiming the camera to get us both in. The struggle is real when you wear contacts and can't open your eyes underwater. The beach was busy but not overcrowded and I could've spent the entire day there but we had to get back on ship and back to the sea. After some shopping in the port (which was really well organized and there were so many shops! ), we got back on the boat and sat on the deck while we pulled away from the port. We ate some lunch and laid in the sun for a bit and I admired the fact that my legs weren't pasty white. For the rest of the day we kept ourselves busy with Bingo, dinner, having drinks at O'Sheehan's, and playing Last Man Standing. We really cleaned up with the prizes during the game. Tim won three times and I won twice! 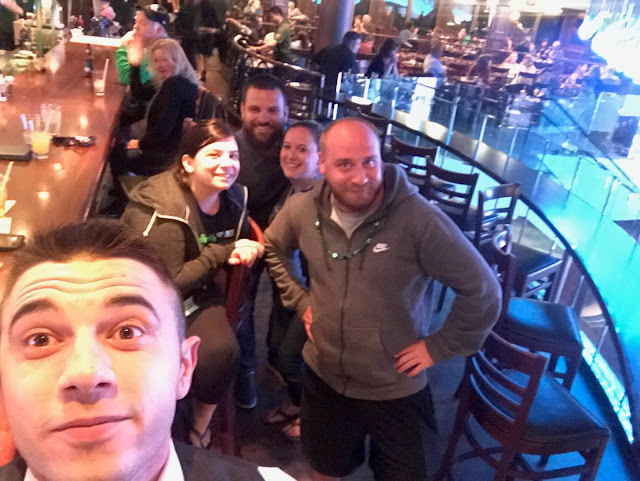 We also played Where Are You Going which was a really fun game hosted in the Spinnaker Lounge. The show on this night was a comedian who was hilarious. We really enjoyed this show! After the show we went to Bliss for karaoke where we watched some fellow vacationers really embarrass themselves. After some drinks at O'Sheehan's to finish the night we headed back to our room to rest up for another day at sea. Our last two days at sea were full of activities. Every night had a beautiful sunset which we always tried to get outside to enjoy. Tim participated in Battle of the Sexes where he had to compete on a team of guys and do all sorts of ridiculous tasks. We also attended a towel folding tutorial which was really cool! There are so many different towel animals and it was cool to watch how they created them! We played Bingo and Deal or No Deal and also a few different trivia games they offered. Another towel animal that was left in our room! Ate the most amazing cheesecake at O'Sheehan's. 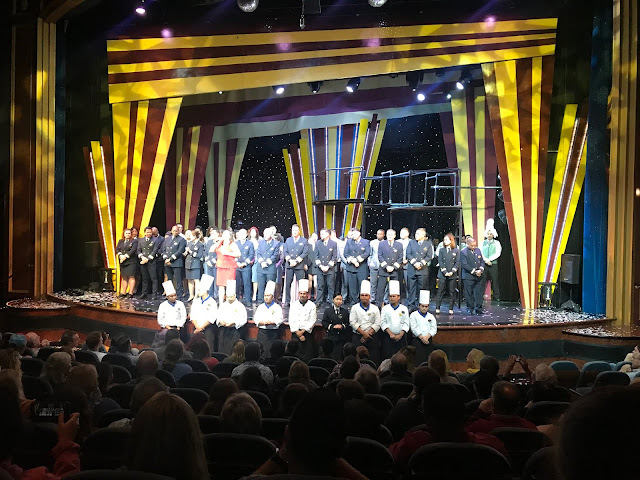 At the end of the final show many of the crew came on stage as they sang You're Norwegian Now which made me want to cry. 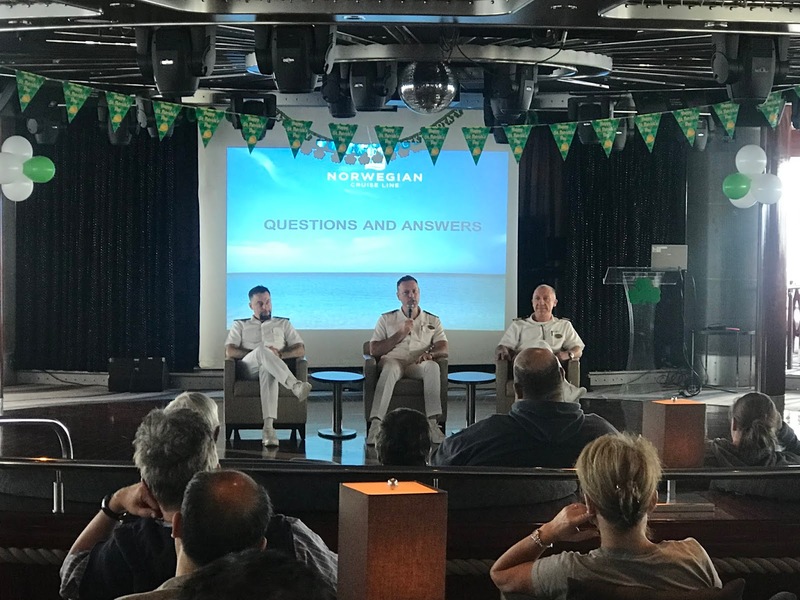 I thought a really cool feature on the last day was a Q&A with the captain, chief engineer, and the hotel manager. It was fun to hear about what life on the ship is like for the people who work there. 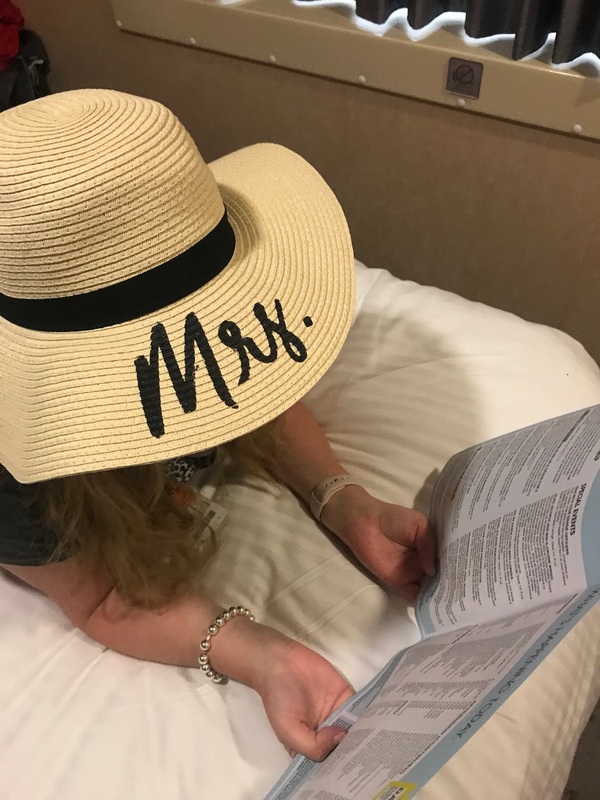 Posing in my Mrs hat to read our last itinerary! On the last night we met another couple that we really liked! We wished we had met them earlier in the trip. The guy taking the photos is Nemo our favorite bartender! He was truly the most engaging and wonderful server we had on the trip and if you ever go on the Norwegian Gem in the next six months or so, go find him! 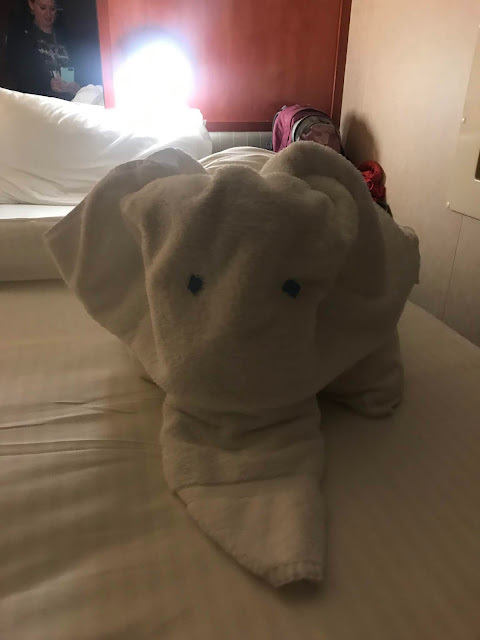 Our final towel animal was an elephant and it was so adorable. The next morning we got up and had to disembark and head home. We were so sad that our honeymoon had come to an end but know that we will 100% cruise with Norwegian again someday! Thanks for sticking around for my honeymoon recaps! If you have any questions about anything please leave them in the comments or email me at balancingonmytoes@gmail.com and I may create a Q&A with helpful cruise tips if there is interest!